During your four weeks abroad on GO London, you will explore one of the world’s most exciting cities while getting to know new friends from all over the US! Whether you want to get a glimpse of the Royal family, see the crown jewels at the Tower of London or take in some world-class theatre in the West End, London has something for everyone. LeadAbroad will help you make the most of your time abroad with our unique personal development focus, three day weekends for independent travel and amazing staff support. GO London begins in July and lasts for 4 weeks. You will enroll one class from our philosophy or communications courses to earn three credits through Oglethorpe University. You will get to know your professor through dynamic discussions, city tours and small group environments. We will facilitate your registration through Oglethorpe so you don’t have to worry about that! Hop on our group flight and we will meet you at the airport and arrange transportation back to our dorms. Day one will include orientation, a city tour and a welcome dinner so you can get to know your fellow travelers. Then you will jump into your courses Monday through Thursday and use afternoons and evenings to explore, check things off of your British bucket list and finish your week’s assignments. The first weekend, we will all explore a new city together and have a chance to bond as a full group. The remaining weekends are up to you whether you want to stay in London, explore the UK or jetset around Europe – croissants in Paris, gondolas in Venice or salsa lessons in Spain – it’s all possible! If you want to travel, the GO team will be there to help you make all of the arrangements to have an amazing time! We can help you research flights, train, hostels, activities and restaurants so you make the most of your weekend. During your time in London, our team will plan a ton of optional activities and clubs. From yoga to coffee club, museum gurus to sports fanatics, we will have activities to fit many interests. And if you see something you want to experience, just let us know and we will help you plan it! Ready to join us in England? Apply here. No need to worry about hostels or Airbnbs – we’ve got you covered. All students will stay in centrally located dorms (zone 1 if you have been to London before) within walking distance to our academic center. Safe locations are our #1 priority for student accommodations to make sure that you always feel comfortable at home. You will also have lots of common space and access to kitchens, plus you will be a 5-10 minute walk from multiple metro stops which is the easiest way to get around the city. GO London courses are offered in communications and philosophy. Our faculty work hard to make their classes engaging and relevant to our host city. Each professor has their own way of incorporating London into the classroom whether it is with site visits, guest speakers, British examples or cultural outings. During your study abroad experience in London, you will enroll for credit in one course offered by Oglethorpe University. On the application, you will be asked to select your top class choices, and we will do our best to meet your academic needs. And don’t forget that all classes run Monday to Thursday so, you have three-day weekends to augment your time abroad. After all three steps of your application are completed, you can be placed into courses that still have open spots. All courses are tentative and subject to change. Summer 2018 courses will be announced in September. The LeadAbroad engagement model is the reason that GO programs are different from the rest. You can travel with many different companies to England, but none of them provide the level of service or support that we do. Our team on the ground consists of a program director, faculty and peer leaders so support you during every aspect of your international experience. If your luggage gets lost, you want to discuss your life plan or you have a hard time making sense of a particular sight or story, we are there to help you connect the dots and make sure that you get as much as you can from your time abroad. Our team, both at home and abroad, will focus on your academic, personal and cultural engagement to make sure you have the best experience possible. The GO study abroad experience begins with learning. We work year round with our faculty to design engaging courses that fit what you are looking for in your time abroad. With an average class size of about 20 students, it’s easy to get to know your peers and master the curriculum. And with the backdrop of London, what could be a better place to learn about the politics of the EU, the genius of Shakespeare or the inner workings of business across borders. Next, our GO model focuses on personal engagement. Through weekly gatherings and social activities, you get a chance to pause and reflect on everything you are seeing and doing. We know you want to take in every sight and city and meal, but reflection is a necessary step to make sure that this experiences has more than a fleeting impact. We will focus our discussions on relevant topics such as how to stay balanced abroad, your core values and cultural dialogue. Through these intentional conversations, our weekly meetings are designed to provide a renewed sense of purpose and direction. The social activities are a great way to expand your network as there is no better way to bond than while we are all making fools of ourselves learning a local dance or attempting to create the best fish’n’chips. Finally, the last piece of the puzzle is cultural engagement. Our team has interests that are just as wide and varied as our students and we strive to make it easy to opt into whichever activities jump out to you. In past summers, we have organized a night out to see Beyonce perform, a taste test of the best gelato in the city, cooking classes, market tours, workout clubs and more. We begin researching events months in advance to make sure that we have a pulse on all of the best events and happenings in the city. And if you see something that you want to do, just let us know and we will make it happen! 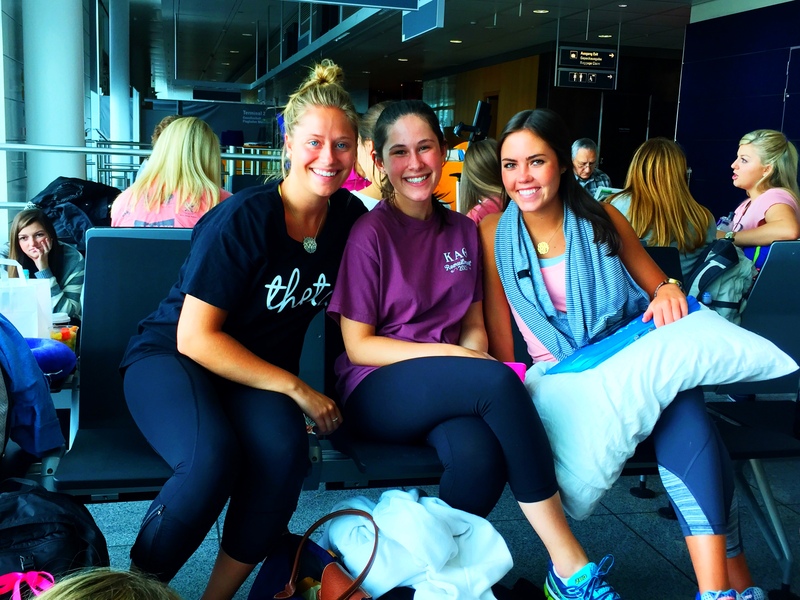 LeadAbroad will recommend several flight itineraries from all over the country for students. This will help ensure that students arrive into London during our arrival window. There are several airports in London, but our program should arrive into and depart from London Heathrow (LHR). In June, LeadAbroad will send you a list of other students on your flight; this is a great way for students to connect with other LeadAbroad participants prior to departure. If you arrive within the designated arrival timeframe, LeadAbroad staff will be at the airport to greet you with huge posters and even bigger smiles. If you are traveling in Europe prior to the program, you can also met us at the dorms to check in with the rest of the group. Your safety is our number one priority on all programs. With a triad staffing model including LeadAbroad program directors, interns and Oglethorpe University faculty, we have a very low student:staff ratio. We execute safety procedures in Italy including assessment, education, security measures, ongoing monitoring and emergency response protocol. The LeadAbroad Policies, Terms & Conditions document outlines these policies in detail. We want every student to remain healthy on the program so they can get the most of their time in London. Though we are prepared for inevitable health issues, we focus on prevention. We combine pre-departure preparation with on the ground strategies to ensure our students are healthy and happy. Prior to departure, every student will complete a detailed health questionnaire. We encourage you to visit your doctor and dentist to ensure that you are up to date on all vaccinations and have complete supply of prescriptions. We also offer international medical insurance through TW Lord & Associates for all LeadAbroad students. It is important to note that this is different than trip protection or travel insurance. We will provide many more details on health and safety information in the student login after you are accepted.